Each fall and spring semester, the College of Arts and Sciences names one faculty member an A&S Prison Teaching Fellow. The recipient of the fellowship has a one-course reduction (main campus) in order to teach for the Alabama Prison Arts + Education Project (APAEP). 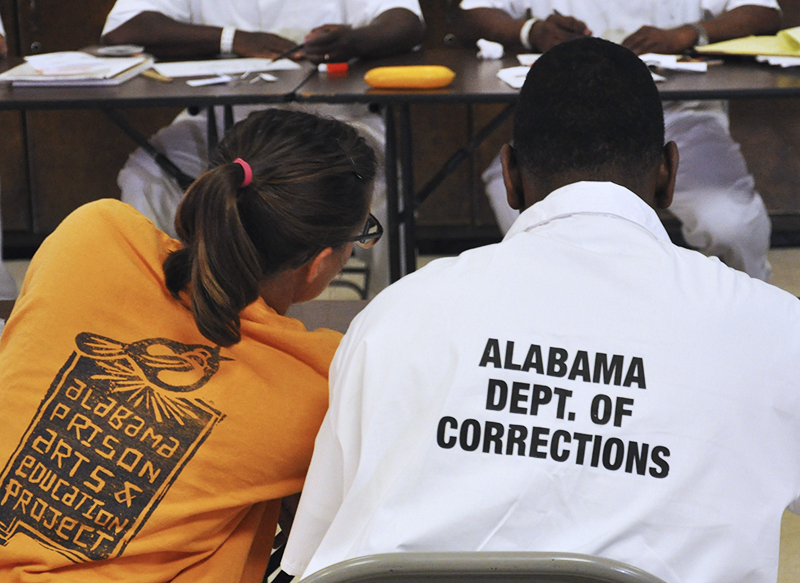 This partnership provides educational programming in Alabama prisons and gives our expert faculty the opportunity to pursue their interests in social justice. Since 2007, the College has offered Prison Arts Fellowships to MFA students in the creative writing program. This new initiative extends these efforts to meet a significant educational need in Alabama. The Alabama Prison Arts + Education Project, located in Auburn University’s University College, has been implementing arts, humanities, and STEM programming in prisons across the state of Alabama since 2003. Founded by Director Kyes Stevens, the program works on the belief that it is important for the adult prison population to gain a quality education and to build a relationship with learning that will continue to grow for the rest of their lives. APAEP provides access to sustained and quality educational experiences in the arts, humanities, hard sciences, and human sciences. APAEP believes that education is a fundamental right of everyone, everywhere. APAEP programming consists of two parts: pre-college programming and college programming. Pre-college classes are freshman- or sophomore-level surveys and seminars offered at correctional facilities around the state. Classes typically meet once a week for 2.5 hours, over a period of 14 weeks. There is a two-step selection process: Departmental/College clearance and then selection by APAEP based on a number of factors (disciplinary need, for example). First, interested faculty should contact and consult with their department chairs to ensure that the teaching needs of the unit will not be too adversely affected by the one-course reduction. Faculty should complete the application form, along with the Chair’s approval and statement of how teaching needs will be covered. This form should be submitted to Associate Dean Tricia McElroy by December 1 for the Dean’s approval. Faculty approved for consideration will then be given the APAEP Teaching application, attaching the approvals of both Chair and Dean, as well as a current curriculum vitae. The College will then forward all of these materials to Kyes Stevens and her staff for vetting and approval. Please direct any questions to Associate Dean Tricia McElroy, tmcelroy@ua.edu.